I wrote last June about an unfortunate British guy who, after his leg was broken by thieves, was told by the government that his injury wasn’t serious enough for an ambulance. The poor chap eventually was driven home by some cops and then had to take an Uber to the hospital. While writing about this story, I semi-joked about what would be required to get an ambulance. If you’re about to die, they’ll send an ambulance. But not for anything less than that. Little did I realize that the bureaucrats would prove me wrong. Here are some amazing excerpts from a story in the U.K.-based Telegraph. A dying pensioner wrote a heartbreaking ‘I love you note’ to his daughters while he waited two hours for an ambulance to respond to his call for help following a heart attack. …The retired mechanical fitter… pulled a cord in his flat in Prenton in Birkenhead, Merseyside, to sound an alarm in a 24/7 emergency call centre and could be heard by the call handler shouting: “Help”. …The call handler dialled 999 but Mr Volante’s case was given a low priority by the ambulance service and paramedics took 1hr 40mins to arrive. They found him dead on his living room floor. In a touching but tragic gesture, the deceased spent some of his wait time writing a note to his daughters. A heartbreaking note was found in Mr Volante’s flat after his death, which read: “I love you Rita, I love you Deb, Dad.” This was a reference to his two daughters, Debbie Moore and Rita Cuthell. I suppose, to be fair, that we can’t fully blame Mr. Volante’s death on government incompetence. He may have died even if the ambulance arrived in a timely fashion. But imagine what it would be like to place a very serious call and to be treated like an afterthought. Though the government at least offered an insincere apology, so I guess that counts for…um, nothing. …a North West Ambulance Service spokesperson said: “The Trust would like to express its sincere condolences to Mr Volante’s family during this difficult time. But let’s look at the bright side. If the ambulance had been on time and Mr. Volante had been admitted to the hospital, the government may have starved him to death instead. I’m guessing a heart attack – even one where it takes you 90 minutes to die – would be preferable. Particularly since you can’t be sure whether government-run healthcare will kill you accidentally or kill you deliberately. P.S. Here’s my collection of horror stories about the U.K.’s version of Obamacare: here, here, here, here, here, here, here, here, here, here, here, here, here, here, here and here. By the way, Paul Krugman tells us that all these stories are false. So who are you going to believe, him or your lying eyes? P.P.S. To be fair, some screw-ups are inevitable, even in a perfectly designed healthcare system. But I would argue that horror stories are more common when the profit motive is weakened or eliminated. If you’re a Brit and you die or suffer because of crappy government-run healthcare, there’s no feedback mechanism to punish the doctor and/or hospital (or, in the above case, ambulance service). Their budgets already are pre-determined. Likewise, if you’re an American and you die or suffer because of sub-standard Medicare or Medicaid treatment, there’s presumably no effective feedback budgetary mechanism. 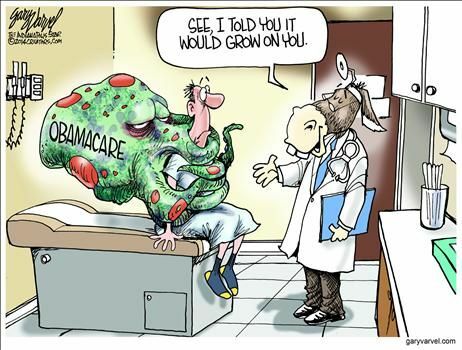 Even before it was enacted, it was obvious that Obamacare was going to have a negative economic impact. From a fiscal policy perspective, the law was bad news because all the new spending and higher taxes increased the fiscal burden of government. From a regulatory intervention perspective, the law was bad news because it exacerbated the third-party payer problem. Form a jobs perspective, the law was bad news because it increased the attractiveness of government dependency compared to employment. But those were just the slap-you-in-the-face impossible-to-overlook problems. As Nancy Pelosi infamously noted, the law needed to pass so we could know what was in it. And the more we learn about the contents, the more evidence we find that (as shown in this poster) that more government is never the answer. A new empirical study by scholars at Harvard and Stanford finds that “free” goodies from the government actually have a hefty price tag. The dependent care mandate…one of the most popular provisions of the 2010 Affordable Care Act…requires that employer-based insurance plans cover health care expenditures for workers with children 26 years old or younger. …there has been little scholarly work measuring the costs and incidence of this mandate and who pays the costs of it. In our empirical work, ….we find that workers at firms with employer-based coverage – whether or not they have dependent children – experience an annual reduction in wages of approximately $1,200. Our results imply that the marginal costs of mandated employer-based coverage expansions are not entirely borne only by the people whose coverage is expanded by the mandate. Wow, this is worse than I thought. I assumed the pejoratively nicknamed “slacker mandate” wasn’t a big issue because the types of kids getting coverage (ages 19-26) presumably had very low health expenses. But if average wages at affected firms are $1200 lower than they otherwise would be, that’s a big hit. Maybe Pajama Boys have physical health problems in addition to their mental health problems. Now let’s look at another higher-than-expected cost, except this time the victims are taxpayers and other health care consumers rather than workers. Obamacare customers are gaming the system, buying coverage only after they find out they’re ill and need expensive care… No one knows precisely how many might be manipulating the system, but the plans say they run up much higher medical bills and then jump ship, contributing to double-digit rate increases and financial losses. Health plans also complain some customers are exploiting a three-month “grace period” — when they can keep getting subsidized coverage even if they’ve stopped paying their share of premiums. In other words, Obamacare is so poorly designed – thanks to subsidies, mandates, and other forms of intervention – that many people can basically wait until they’re sick before signing up. Then they incur expenses that are covered by taxpayers and/or passed on to other healthcare consumers. There’s also another group of victims, though I confess that part of me thinks that the insurance companies deserve to suffer since they (like Big Pharma) endorsed Obamacare. …those trends make the risk pools skew toward sicker, costlier customers — and under Obamacare, plans can no longer deny coverage to those with expensive medical conditions. That problem has been exacerbated by the large numbers of healthier people who are choosing to stay uninsured rather than shell out money for coverage. Yup, I experience a warm glow of schadenfreude after reading that passage. But I also know that it won’t be good for the American economy and the American people if the market for private health insurance entered an Obamacare-driven death spiral. That being said, I also don’t want them to get any bailout cash. In any event, if the health insurance companies have a meltdown, you could bet your last dollar that the crowd in Washington somehow will blame capitalism and say that the solution is single-payer health care (even though that system is so dysfunctional it was repealed by Bernie Sanders’ Vermont and even though that system leads to endless horrors in the United Kingdom). P.S. In the interest of fairness, I will admit that there is a group that has benefited from Obamacare. P.P.S. Actually, there’s another group, so we can say there are two winners from government-run healthcare. I guess one could argue that the determination of “scare stories,” like beauty, is in the eye of the beholder. But if I was writhing in agony on a street because of a broken leg, I wouldn’t be happy with a healthcare system that told me I didn’t need an ambulance. And if I was part of a system that rewarded hospitals for letting old people die, I might be tempted to say that was a scary system. Moreover, I would be understandably irked if my I was stuck with a system for healthcare that treated patients with callous disregard. But if you’re wealthy and well-connected, then perhaps you don’t think these results are scary because you know you’ll always be able to jump the queue in a government-run system and get good treatment for yourself. In any event, it’s not just the healthcare system that’s scary on the other side of the Atlantic. Dental health standards are falling to “Third World” levels in parts of England because of a crisis of access to NHS treatment, more than 400 dentists claim today.In a letter to The Telegraph, a coalition of professionals from across the country argues that the system is “unfit for purpose” with millions of people seemingly going for long periods without even seeing a dentist, or ignorant of basic dental hygiene.The signatories accuse successive governments of hiding the problem behind a veil of spin and denial. They point to official figures showing large numbers of primary school children having to be admitted to hospital to be treated for serious tooth decay and other dental problems, many of which, they say, could be easily prevented. As you might expect, the bureaucracy claims everything is just fine. NHS figures show that almost half the adult population of England (48 per cent) and a third (31 per cent) of children have not seen a dentist within two years. Crucially almost 62,500 people are admitted to hospital in England per year because of tooth decay – three quarters of them, or 46,400, children. …“The NHS dental system in England is unfit for purpose,” the dentists wrote. “Far from improving, the situation has worsened to such an extent that charity groups normally associated with providing dental care in Third World arenas now have to do so in England. None of this sounds very good, though let’s acknowledge that the dentists in the U.K. are an interest group that presumably wants to get a bigger slice of government money. 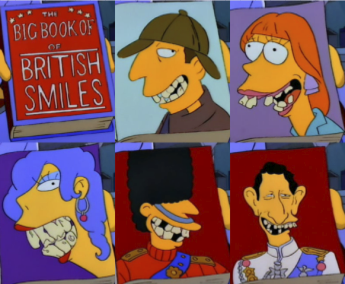 So they presumably would have an incentive to exaggerate the downside of British dental care. But this underscores the problem with government takeover of a sector. Instead of a system of voluntary and beneficial exchange, you suddenly have a zero-sum, third-party-payer-driven system where consumers, providers, and taxpayers suddenly have an incentive to squabble. P.S. For other U.K. “scare stories,” see here, here, here, here, here, here, here,here, here, here, here, here, here, here, here, here, here and here. 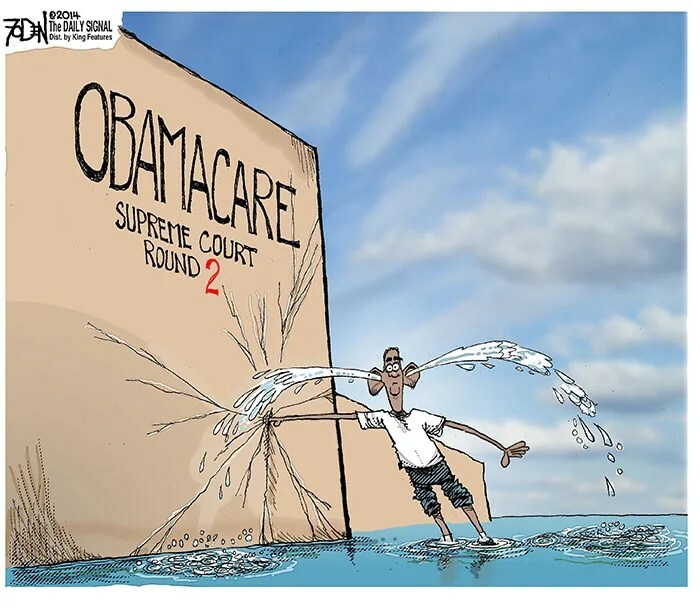 In the grand scheme of things, the most important development in health policy is the pending Supreme Court case revolving around whether subsidies can be provided to people obtaining health insurance from the federal exchange, even though the law explicitly says handouts are only available to people getting policies via state exchanges. If the Court rules correctly (unlike, ahem, the last time the Justices dealt with Obamacare), it will then be very important that congressional reformers use the resulting mess to unwind as much of the law as possible. That will be a challenge because statists already are arguing that the “only” solution is to re-write the law so that subsidies are also available via the federal government. For what it’s worth, my colleague Michael Cannon outlines the right strategy in Cato’s newly released Policy Priorities for the 114th Congress. But let’s set aside that issue because we have a great opportunity to review another example of how government-run healthcare is a miserable failure. Our topic for today is government-dictated electronic health records (EHRs). Dr. Jeffrey Singer is on the front lines of this issue. As a physician in Arizona, he deals with the real-world impact of this particular mandate. And he’s so unhappy that he wrote a column on the topic for the Wall Street Journal. Starting this year, physicians like myself who treat Medicare patients must adopt electronic health records, known as EHRs, which are digital versions of a patient’s paper charts. …I am an unwilling participant in this program. In my experience, EHRs harm patients more than they help. By way of background, he explains that EHRs were part of Obama’s failed “stimulus” legislation and they were imposed on the theory that supposed experts could then use the resulting data to make the system more efficient and effective. The federal government mandated in the 2009 stimulus bill that all medical providers that accept Medicare adopt the records by 2015. Bureaucrats and politicians argued that EHRs would facilitate “evidence-based medicine,” thereby improving the quality of care for patients. But Dr. Singer says the real-world impact is to make medical care less effective and more expensive. Electronic health records are contributing to two major problems: lower quality of care and higher costs. The former is evident in the attention-dividing nature of electronic health records. They force me to physically turn my attention away from patients and toward a computer screen—a shift from individual care to IT compliance. …The problem is so widespread that the American Medical Association—a prominent supporter of the electronic-health-record program—felt compelled to defend EHRs in a 2013 report, implying that any negative experiences were the fault of bedside manner rather than the program. Apparently our poor bedside manner is a national crisis, judging by how my fellow physicians feel about the EHR program. A 2014 survey by the industry group Medical Economics discovered that 67% of doctors are “dissatisfied with [EHR] functionality.” Three of four physicians said electronic health records “do not save them time,” according to Deloitte. Doctors reported spending—or more accurately, wasting—an average of 48 minutes each day dealing with this system. Here’s what he wrote about costs. Last but not least, Dr. Singer explains that electronic health records don’t reduce errors or increase efficiency, notwithstanding the claims of advocates. The EHR system assumes that the patient in front of me is the “average patient.” When I’m in the treatment room, I must fill out a template to demonstrate to the federal government that I made “meaningful use” of the system. This rigidity inhibits my ability to tailor my questions and treatment to my patient’s actual medical needs. It promotes tunnel vision in which physicians become so focused on complying with the EHR work sheet that they surrender a degree of critical thinking and medical investigation. Not surprisingly, a recent study in Perspectives in Health Information Management found that electronic health records encourage errors that can “endanger patient safety or decrease the quality of care.” America saw a real-life example during the recent Ebola crisis, when “patient zero” in Dallas, Thomas Eric Duncan, received a delayed diagnosis due in part to problems with EHRs. Wow, not exactly an uplifting read. Indeed, Dr. Singer’s perspective is so depressing that I hope he’s at least partially wrong. Maybe after a couple of years, and with a bit of luck, doctors will adapt and we’ll get some benefits in exchange for the $20 billion-plus of taxpayer money that has been plowed into this project (not to mention all the time and expense imposed on the medical profession). 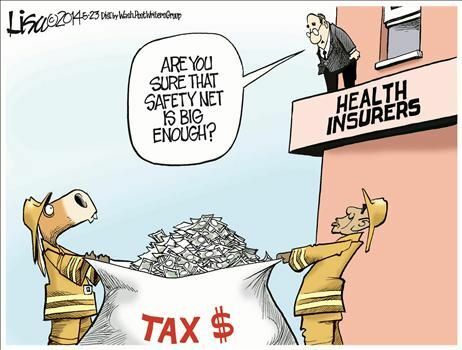 But the big-picture lesson to be learned is that planners, politicians, and bureaucrats in Washington should not be in charge of the healthcare system. Which brings us to the real challenge of how to put the toothpaste back in the tube. 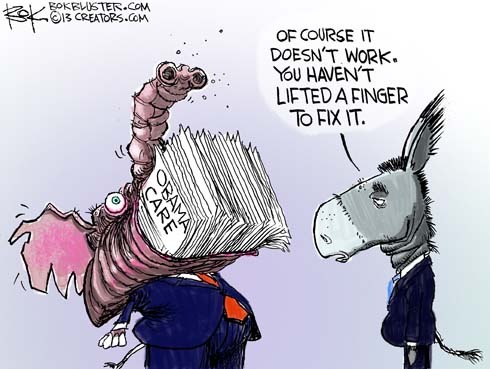 Government intervention is so pervasive in the healthcare sector that – with a few rare exceptions – normal market forces have been crippled. As such, we have a system that produces higher and higher costs accompanied by ever-rising levels of inefficiency. Amazingly, the statists then argue that more government is the only solution to this government-caused mess. Sort of Mitchell’s Law on steroids. But that path leads to single-payer healthcare, and the horror stories from the U.K. should be enough to show any sensible person that’s a bad outcome. The only real solution is to restore a free market. That means not only repealing Obamacare, but also addressing all the other programs and policies which have caused the third-party payer crisis. P.S. Just like yesterday, I want to finish a grim column with something uplifting. Here’s a sign that will irk statists driving through one part of Pennsylvania. Now take the IQ test for criminals and liberals and decide whether this means more crime or less crime. If you’re having trouble with the answer, here’s a hint from Chuck Asay.